You can flip a layer using the Transform tool. There are two ways to flip. The Flip Horizontal command flips the layer following the Camera view X-axis. The Flip Scale X command uses the original X-axis of the layer and flips the element following it. In the Camera view, use the Transform tool to select a drawing layer to flip. From the top menu, select Animation > Flip > Flip Horizontal or Flip Vertical. In the Tool Properties view, click the Flip Horizontal and the Flip Vertical buttons. 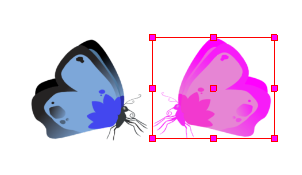 In the Camera view, use the Transform tool to select an element that has already been transformed. From the top menu, select Animation > Flip > Flip Scale X or Flip Scale Y.